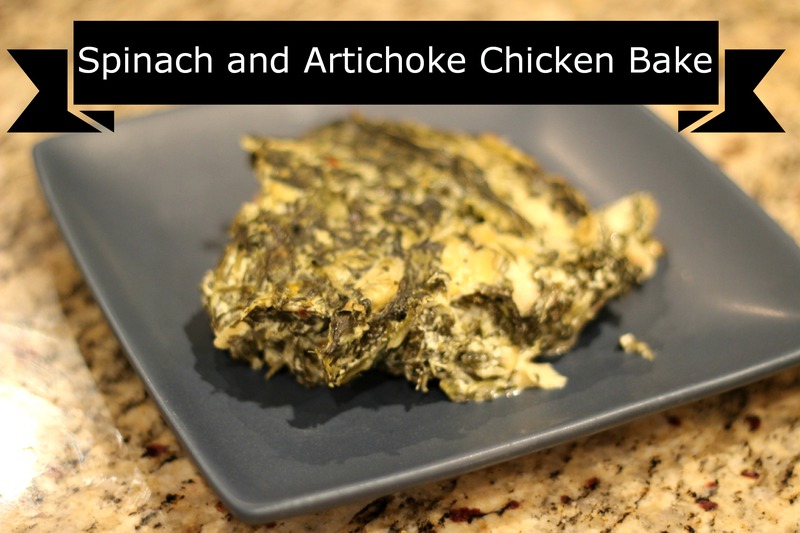 Spinach and Artichoke dip is a favorite for our family. My in-laws came in from Louisiana to stay with us for Thanksgiving and I wanted a real treat to make for them. I made a spinach and artichoke dip for my small group a few weeks ago and had an idea to turn it into a dinner. So the idea was born: Spinach and Artichoke Chicken Bake. I served the spinach and artichoke chicken bake the night before Thanksgiving. I had some of my sugar free cranberry sauce around to make baked brie with pecans and cranberry sauce along with rice crackers. I also made a sweet potato, apple and walnut bake in the crockpot. For a snack I made pumpkin cookie dough dip with apple slices and Stacy’s Crock pot Cocoa Almonds. This is such a winner meal!!! It is easy enough to make for a week night dinner and SO yummy to be able to make for company. 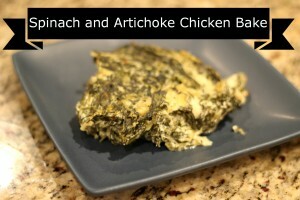 Everyone loved the spinach and artichoke chicken bake and went back for seconds! This is such a great recipe to have handy for Trim Healthy Mamas during the holidays! It is easy to put together and so yummy all your non-Trim Healthy Mamas will love it too! When calculated to have 8 servings with low fat cream cheese it is only 5 grams of fat per serving and is low in carbs as well! But if you want to enjoy seconds, then forget that and just enjoy it as a very very yummy S (satisfying) meal. Last time I fixed it, I tossed it all with cooked spaghetti squash. It was a neat twist on the recipe and really felt like we were cheating!! A variation of a classic loved dip. For Trim Healthy Mama's, this is a Fuel Pull meal! Place chicken in lightly oiled 9x13 inch baking pan. Season with salt and pepper to taste. Place in preheated oven and bake 20 minutes. While chicken is baking, in large skillet, melt oil on medium high heat. Saute onion and garlic until onion is transparent. Add both bags of defrosted spinach. Cook until heated through. Add seasonings: salt, pepper, red pepper flakes, and Italian seasoning. Turn heat to low and stir in cream cheese and yogurt. Once cream cheese is melted, add artichoke hearts and Parmesan cheese. Spread spinach mixture over chicken and bake 25 more minutes.